28th January was a bit of a strange day for Ukrainian media and the rule of law in the nation with regards to international commentary. In what was an absolutely foregone ruling, Aleksie Pukash was quite rightly jailed for life for his part in the murder of Gregory Gongadze – something hailed as a “milestone toward justice” by the New York based Committee to Protect Journalists. I have to say “milestone towards justice” seems a little overenthusiastic when it comes to metaphors, considering those who gave instruction to Pukash to carry out this heinous act remain free and were not implicated in the Pukash court ruling. Plus, as I say, the verdict was never in doubt. On the same day, the Parliamentary Assembly of the Council of Europe (PACE) issued its “State of Media Freedom in Europe” report in which there are significant issues concerning Russia, Turkey, Armenia, Azerbaijan, the UK, Bulgaria, Belarus, Greece, Hungary, Italy, Romania, Serbia, FYR Macedonia and of course Ukraine. previous failures to deliver prompt and impartial justice as significant setbacks in the fight against impunity. physical attacks, and suffered censorship. innocent and that he had been attacked in retaliation for critical reporting on local government issues. enforcement agents or other public officials. Not much surprising in any of that – other than how little content there actually is relating to Ukraine. Will any of what was written about Ukraine by the CPJ or PACE change the way media operates in Ukraine despite their encouragement? Of course not. What will change the way media operates in Ukraine is the split of the oligarchy from “the family” within the Party of Regions when it comes to media manipulation – at least for the time being. As the 2015 presidential elections get closer, you have to foresee a situation where “the family” will be forced into the backseat once again in favour of the oligarchy media assets as fas as President Yanukovych is concerned – thus their inclusion back to the inner, inner circle is likely to begin in 2014. Hopefully by that time, the oligarchy will have been left out in the cold slightly too long and will have found a horse they prefer to back other than Yanukovych. Well this should be an interesting week. Naturally Ukraine is not keen on paying Russia the $7 Billion it contractually owes. Neither is it keen on raising the gas prices for its population or export producing industries to please the IMF. Rumours of Ukrainian default to foreign debt holders will simply drive the cost of external borrowing through the roof via traditional sources. Very difficult for any of those involved in any of the negotiations with any external party – not that any of those that make the press statements are likely to have been directly involved in such difficult discussions. Very grim – but there is always the calculating Chinese to sell or rent what is left of the family silver to……which I touched upon yesterday. Naturally the EU is publicly mute thus far. Update! : Rumour has it that on 30 January, Naftagaz has borrowed $5.9 billion from Delta Bank to deal with the Russian gas bill, with the bank profit being $240 million. Who owns Delta Bank these days? Obviously much has happened since I last wrote anything on the subject. So much in fact, that I intend to stay local and write a few lines about some of the most noticeable and strategic Chinese investments in Odessa. The first of note is a $600 million investment in a new business park on the Kyiv-Odessa road in the Ivanivka region of Odessa. (About 70 kilometers from the city of Odessa.) Here a 190 hectare agricultural processing centre with silos, grain elevators and vegetable storage facilities is about to commence. This will be the 4th such Chinese business park investment in the region. Thus far Chinese firms such as Qitele and Sinomach have taken on the project engineering. The Odessa regions of Biliaivka and Kominternivske are next for the Chinese investment treatment. Also, the Chinese have done a deal with Transinvestservice who own land adjacent to Yushni port and are ready to invest a very large sum in developing a business park there focusing on the port facilities – something those within the Odessa Regional Administration tell me will begin sometime this year. It seems logistical hubs are of particular interest to the Chinese when it comes to Odessa – especially in the areas of agriculture, manufacturing and international transportation – and quite rightly. Whoever is looking after bilateral trade at the new and very nice Chinese Consulate in Odessa is doing a very good job for China whilst doing a decent job at delivering industrial/commercial infrastructure of Odessa. The question is, at what eventual cost to Odessa? As for the UK, well, we don’t have anybody in Odessa in any official capacity – unless you count the Ukrainian lady who runs the British Council on Bolshoy Fontana, 15 minutes walk from where I live – so when it comes to the fairly frequent local diplomatic functions we have no ears in the room – and thus I am forced to get my information from City Hall, the Oblast Administration, or more often than not, those I know who work within them and are happy to tell tales out of school. Referendums – Personally I like the idea of referendums as they are the closest thing to actual democracy that exists in modern times – which explains was governments world wide, with the exception of Switzerland (who regularly have referendums), seem to shy away from them. With no arbitrary lines drawn on maps to massage the number of voters likely to vote one way or another, and thus insure a parliamentary majority through moving constituency borders – a regular game in the UK – and no electoral colleges able to skew a vote as in the USA for example – referendums really do come down to the popular choice of the public – or at least the public that bother to take part in any referendum. Hence nobody in politics really likes them as they are not particularly “manageable” and the outcome not necessarily predictable either – especially so when the bigger percentage of what may be a very small turnout, can bind a nation to what seems a dire course. On occasion, a referendum may give a result that really screws up the grand plan, of recent note, the first Irish referendum result that blocked the EU Lisbon Treaty, thus causing the Irish to hold a second referendum after extreme pressure from the EU to provide the “right” referendum result. Soon we will possibly have referendums in Scotland over leaving the UK and in the UK over leaving the EU. It also provides a mechanism that allows for changing the constitution, no longer requiring 300 MPs to vote in favour of any notion prior to taking matters to public referendum. That may or may not be a good idea given that it is almost impossible to garner that many votes in favour of anything in a traditionally partisan RADA. That is not to say it is necessarily easy to call for a referendum for those not in politics. Whilst it seems politicians no longer hold the only key to calling one in Ukraine, the new law allows any citizens and organisations to do so as well, it qualifies this with a requirement of diverse regional support – thus insuring western Ukraine cannot force a referendum without some support from eastern Ukraine and vice versa. All Ukrainians are allowed to participate in any referendum, and those who do not are automatically assumed to have given their mandate to those who bother. All of that said, the Ukrainian political elite, like their European and global counterparts, will not been keen to call any referendum unless the result is almost guaranteed to be the one they favour. Why hold a referendum when you can hide behind the tired cliché of “popular mandate” for anything you do in office most of the time – and get your way? It is probably the fact there are so few referendums held (outside Switzerland) that I am actually quite keen on them – unpredictability, democracy and all that! 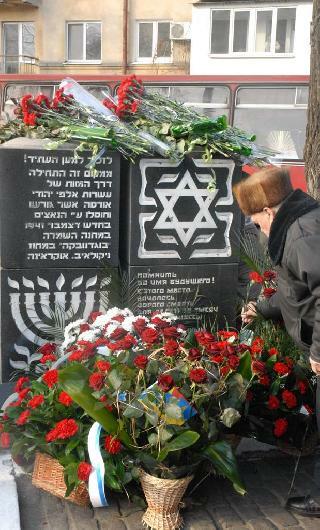 Taking a break from current issues, and returning to some haunting issues of the past, today is the official Holocaust Memorial Day in Odessa, with wreath laying and accompanying ceremony taking place at 11am at the Holocaust Memorial situated in Prokhorovskiy Square. For those who may find it interesting, the monument is situated in a place that was known as the “Road to Death” during WWII/Great Patriotic War – for it was the departure point for many from Odessa who would soon find themselves in concentration camps. A few days ago, Yulia Tymoshenko made the following statement calling for the opposition parties to unite. “The ideal scenario would be further integration processes among opposition forces and the creation of a united party because the steam roller of the Regions Party can be stopped only by a powerful opposition force, which will enjoy unquestionable support in society. A merger of opposition forces and society will accelerate the death of this colossus on clay feet, in other words the Yanukovych regime“. At least that is what her Batkivschnaya Party website quotes her as saying. Whilst there may be issues to be concerned with within Svoboda ideology, it at least has a clear and identifiable political ideology – even if it is one that doesn’t sit well with many within UDAR for example. UDAR too seems to have an identifiable ideology which is located in a far more central part of the political spectrum. The ideology (narcissistic and autocratic as it is) of personality politics with the associated grab power and keep it mentality, which is shared by both PoR and Batkivschnaya parties – certainly amongst the leaderships of both in equal measure – is most certainly going to fail eventually. Sooner rather than later one hopes. There are other issues that both Klitschko and Tymoshenko will undoubtedly be aware of relating to external influences that will affect their futures. Foremost amongst them is the noticeable desertion of many oligarchs (and ergo their money and media assets) from the PoR conclaves. They have now been replaced by trusted family and friends of the current President. If the oligarchy needs are not met for the most part, having been removed from the inner santum, there is every chance their money and media assets will seek to back another horse – any horse other than Tymoshenko. Seemingly the best fit would currently be UDAR – either overtly or covertly. With enough oligarchy money and media time behind UDAR, there can be little doubt that unless Klitschko seriously stains his copy-book before the next Presidential elections, the run off would be between him and the current incumbent as things stand today. Something both he and the ego of Tymoshenko will be aware of and something that Tymoshenko is all too aware she can do nothing about (whether in jail or not) short of assimilating him. It is therefore understandable, as this realisation (amongst many) looms, that she is calling for a single opposition party to take on the PoR. A party that should it be formed now, would have a majority of her MPs and thus possibly propel her back to the pinnacle of Ukrainian politics if/when she is ever released. Bugger ideology, the enemy of my enemy should be my friend as her public mantra – if not her personal driver – that driver being the same as it always has been, personal power for power’s sake – no different from Yanukovych. Thus the entry of real ideology into Ukrainian politics (rather than wafer thin ideological rhetoric), the disillusionment of some of the oligarchy with the PoR and a probable need for them to find a better horse to bet upon should their needs fail to be met by the current majority, and the emergence of those within her own party using her absence to further their own future political prospects (namely replacing her) would make it seem natural for her to use the veneer of a single opposition party to protect her own interests whilst she still remains with sufficient support within her party to reinstall her as head honcho should she be released. As time passes, all her concerns are going to become realities, thus consigning her to the political minor league upon her eventual release – even within her own party. Klitschko however, needs only to continue to do what he is doing, avoid any major media scandals, stick to his party ideology and keep his own and his party’s identity separate from Tymoshenko and her Batkivschaya Party (and others for that matter). In the long game of politics, ideology will eventually beat personality politics – and fortunately that means both Yanukovych and Tymoshenko will be consigned to the dustbin of Ukrainian public life within the next decade – and not a moment too soon. One wonders just how much time will pass before Tymoshenko takes a very public swipe at UDAR and Klitschko out of desperation, just as she has did Yatseniuk in 2009/2010. A few weeks, a few months, a year? Place your bets! No this blog is not going to change theme and become a Council of Europe/PACE watchers commentary, despite the entries of the past few days. However with Ukraine holding the Chair of OSCE for 2013, I will obviously be commenting a little more on the occurrences of an international organisation that often seemingly runs in parallel to that currently chaired by Ukraine. Thus, following along the recent entries relating to the Council of Europe/PACE and Ukraine, 2 days ago in what may have had significant implications for the Ukrainian opposition, civil society and media, PACE debated the situation in Azerbaijan (a situation decidedly worse than currently exists in Ukraine for opposition politicians, NGOs and media alike). In short there were 2 reports being considered by PACE in relation to Azerbaijan. The first (Doc 13084) to continue with the status quo of “monitoring” the situation and stress the requirements and obligations to the Council of Europe by Azerbaijan. This was adopted (196 votes in favour, 13 against and 16 abstentions) and effectively continued the existing arrangements and dialogue without rocking the boat. The second (Doc 13079 – No official link to unadopted text was found at the time of writing) which in summary related to actually doing something about State pressure and political prisoners within Azerbaijan. This report was not adopted (70 votes in favour, against 125, abstentions 20) – despite I would add, some vigorous supportive lobbying by some of the Ukrainian opposition party members that are included in the Ukrainian PACE delegation. MPs Oleksandr Shevchenko (Svoboda) and Pavlo Riabikin (UDAR) voted for the resolution. Batkivshchyna MP Volodymyr Ariev abstained, while other BYuT MPs, Serhiy Sobolev and Lesia Orobets, did not participate in the vote. Representatives of the Party of Regions and the Communist Party voted against the document. It would be kindly of me to think that the Ukrainian opposition members within the Ukrainian PACE delegation felt they were acting purely in support of others they feel are politically repressed (if not more so) than they feel – and thus there was no ulterior motive for their support and very active lobbying – but I know personally Ukrainian politicians from most parties including from within the opposition ranks, and thus I am not that generous of thought with regards to their motivation for anything they do regardless of their political affiliations. Likewise it would kindly of me to think Mr Sobolev simply was unavoidably absent rather than thinking of his personal future prospects with Ms Tymoshenko remaining in jail. Had the opposition won that last parliamentary elections, it is widely rumoured he would have been Prime Minister. One can only presume that the opposition members of the Ukrainian delegation that sought to get the second report adopted less so for those affected in Azerbaijan, but in order to set a precedent there, that could then be argued for with regards to other nations and thus be rolled out – those nations including Ukraine – naturally – and ergo serving the interests of the opposition. The reasons for those amongst the opposition that failed to vote in favour of this report seem only to have personal gain as a motive. Those that tried to get the report adopted were quite right to try and seize the opportunity presented to them, but fell a very long way short of getting the report adopted. Thus if PACE will not move on Azerbaijan when deliberating the adoption of reports over issues such as political prisoners, there is not much hope that it will do so in any meaningful way when it comes to Ukraine – other than “monitoring” – as in Azerbaijan. A situation not helped by the leading opposition figures amongst the Ukrainian delegation! One suspects that numerous sovereign national interests (and some personal ones) trumped values once again – for the time being at least. You are currently browsing the Odessablog's Blog blog archives for January, 2013.